Combi is a brand with over 50 years of experience behind them. Combi is the biggest brand in Japan, and is also huge in Australia, Malaysia and China. Combi has been brought to the UK by an amazing lady, who feels that parents in the UK, should also be able to experience these easy to use pushchairs. 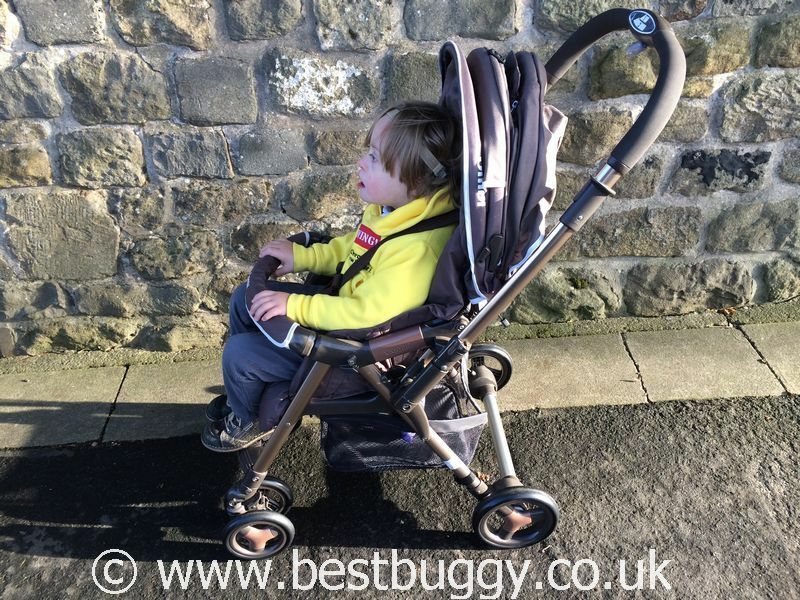 She has kindly allowed Best Buggy the official first, exclusive UK review of the Combi Urban Walker. The Combi pushchairs very are simple to use. There are currently two models of Combi pushchair here in the UK – the Urban Walker and the Well Carry. We believe that the Well Carry has similarities to the Urban Walker. However, the Combi Urban Walker has a hidden surprise – there is a flip over handlebar which means that the parent can push the pushchair from either side. Therefore the occupant can either parent face, or forward face, depending on where the handlebar is situated. Combi have pointed out that the new Combi products are more luxurious, than the older Combi products, last seen in the UK a few years ago. Certainly one area that the quality is highlighted in the thick and snuggly footmuff which is included in the package. The Combi Urban Walker is unusual for a modern day pushchair, because you can literally open the box and the Urban Walker is ready to go! It is one piece with the seat attached. There is nothing that needs fitting or fixing. The hood is fixed in position, the brakes are connected, and the wheels are pre-fitted. It was bliss to have a pushchair which was ready to go straight from the box. The biggest positive of the Urban Walker is how incredibly light it is, at just 7.2kgs. For a full sized pushchair this is excellent. The Combi Urban Walker has a very tall seat back (one of the tallest we have measured). This combined with a deep seat makes the Urban Walker a good choice for older children. Master BB is 98cms tall and he looks very comfortable in the seat. He has ample room, and plenty of head room. His feet rest well on the footrest. The Urban Walker has been certified for use up to 20kgs, which is a generous weight for a lightweight pushchair. There is plenty of space for a child to stretch out and nap comfortably. There is calf support for little legs – two bars can slide out from underneath the seat – which means that children can rest their feet comfortably whilst they nap. The front edge of the seat fabric then attaches to each bar using press studs. This is easy enough to do, but we are not sure whether you would always take the time to attach the press studs – it does take a minute or so to line the press studs up and push them down hard. The Combi Urban Walker is also suitable from birth. When the seat is laid down flat, the top of the seat then forms three ‘sides’ to make an enclosed space around the child’s head, a little like a carrycot. Our concern is that the harness is not spaced correctly to be suitable for a small baby. The crotch strap is about 10cms too low for the shoulder and side straps to then fit correctly. However, the use of a cocoon or baby nest may restrict this space. Combi do make a newborn insert, however we do not know if this is available in the UK. The fabrics are excellent quality. They appear to be strong and should wear well. The seat and base are boarded with plenty of padding on top and at the sides, to keep a little one comfortably supported. The seat lies flat using a toggle system. The seat can be set in any position between upright and lie flat. To recline the seat, there is a loop at the rear of the seat to hook a finger through. Pulling will lower the seat to the desired position. To push the child upright again requires the toggles to be pulled tight. There are two toggle strings and both need pulling. The Urban Walker seat can be pushed upright from behind and will stay upright, which allows you then easily to pull the cords tight to maintain the position. The harness is thick soft cotton type webbing which is comfortable on your child’s skin. On the reverse of each shoulder harness is a piece of black non slip plastic. We assume this is to try to keep the shoulder straps in position on the child, which is a neat touch. The harness splits into 5 pieces. The shoulder straps have loops at the bottom which need to slide onto the waist straps each time. This is not difficult to do, but it is an extra step to do when trying to secure a wriggly child. What I did find frustrating was that the long end of the shoulder straps comes down in front of the loop, thus obscuring it. Numerous times, I found myself trying to insert the waist buckle into the end of the shoulder strap, instead of into the loop behind it. Frustrating, especially when it is dark. One side of the buckle can be done up or released at a time which is handy. The Combi Urban Walker hood is absolutely ginormous and can extend all the way down over the child. Any child is going to be well protected from the elements, and will have a dark space to nap underneath the canopy. The front section has locks on each side which keeps the hood taut. The rear sections can be held back using clips to stop the excess fabric getting in the way, and then can be released if required. This is something we have not seen on another pushchair and it is a great idea. Despite the quantity of fabric, the hood amazingly pushes back well when not in use. There are two mesh panels in the hood, through which you can peek on your child, and which allows ventilation if required. There is one panel at the rear for when the child is forward facing, and one at the front for when the child is rearward facing. The rear panel is opened by undoing two zips which is a little noisy. The front panel has two press studs holding the flap in place. These are quite noisy, and they need two hands to close again. The Urban Walker does not come with a raincover. This is an optional accessory, so remember to order one if you need one. However, with such a huge hood, it may simply be easier to pull the hood down and run! The Urban Walker comes with a padded bumper bar. I love that the bumper bar keeps its shape when the pushchair is opened, however it is also soft and semi flexible so that a child couldn’t hurt themselves on it. The bumper bar is gate opening. The opening is a little rudimentary – 2 buttons to push in, and a tug - but it works. We don’t believe that the bumper bar can be removed. The Urban Walker basket is a decent size. It has a large opening and is accessible from both sides. I had no problem fitting my medium sized handbag, children’s rucksacks, coats etc. in there. However, it may be difficult to fit a larger changing bag in, so choose your bag carefully. The Urban Walker comes with a really beautiful thick, fleece lined snuggly footmuff. It is good quality and warm. A lovely surprise! The Combi Urban Walker is really easy to push and manoeuvre even one handed, when the seat is forward facing. We love the narrowness of this pushchair to fit into tight spaces easily. We took the Urban Walker into school one day, and it easily wove a path between small chairs strewn across the room. The Combi Urban Walker has two sets of double hard plastic wheels at the front and two single wheels at the rear. When empty, the Urban Walker does feel rattly with some movement in the chassis. However, with a child in the seat and out and about, we never really noticed this. It has felt sturdy to push with good front suspension. The Urban Walker handlebar can be reversed by flipping it over the top of the seat. Sliders on a each side of the handlebar release the handle, and then it can be really easily moved over the seat to the other side, where it clicks securely into position. This is much simpler to do than removing the child and turning the seat around. This feature has been very useful in confined spaces, where we needed the handlebar out of the way. The disadvantage of having a flip handle is that when the seat is parent facing, the swivel wheels are then at the rear of the pushchair. Thus rear steering can be challenging and needs practice. We haven’t achieved enough experience to be let loose in a confined space yet! We suggest locking the front wheels from swivel to the fixed position, as this makes pushing much simpler although you lose manoeuverability. Interestingly the wheels lock forwards instead of underneath the pushchair. We assume this gives extra stability. The flip handle also means that the handlebar can be moved out of the way so that the Urban Walker can be pushed right up to a table, or to give a clear view out to watch something. The child can then play or drink at table height if necessary. The handlebar itself is dense foam. The fold buttons are situated in the centre of the handlebar. The handlebar then curves downwards. The handlebar height is fixed but it is a comfortable height for me to push at 5ft 6ins, although another cm or so would be great. The Combi Urban Walker has a handbrake. This was a real bonus! It is so handy to have a handbrake. Simply push the handle forwards to apply the brake, and pull it backwards to go again. Unless of course you have flipped the handle, and then the reverse applies! Simple to apply and there is a clear click once it is engaged. The fold and unfold on the Urban Walker is very unusual. It’s beauty is in it’s simplicity. It is so easy, but it is nothing like any other fold we have seen! On the handle there are two buttons. One is a squeeze button and the other is a slider button. Simply slide the top button and squeeze. Push the handlebar slightly down vertically towards the floor, and the pushchair folds easily into a standing position and locks. I love how this can all be done one handed – great for parents who use the bus. Note, the handle needs flipping back over to forward facing before folding. At this point I can not emphasise enough how light weight the Combi Urban Walker is. The Urban Walker is a full sized pushchair with the weight of an umbrella fold stroller. It is absolute bliss to lift, carry and fling into a car boot. However, we suggest that you ensure that the Urban Walker will fit into your car boot when folded before buying. Most of the pushchairs we test here at BBHQ do fit in along the short side in our car boot, but the Urban Walker had to go in lengthways. We especially love how the Urban Walker freestands easily and securely when folded. It has been very easy to store and would be an asset in a home where space is limited. To unfold the Urban Walker, there is a lock mechanism which is released by pulling a slider up on the left hand side of the handlebar. Then use the same buttons as folding. Slide the sliding button to the right, and squeeze in the squeeze button. The Combi starts to open. Pushing downwards will continue to open the pushchair until it clicks open, and is ready to go – all one handed! The Combi Urban Walker is the perfect no fuss, lightweight, throw in the car or take public transport pushchair. The stroller is self contained and is ready to go straight from the box. Having the flip over handle is really handy for a number of reasons including the choice of directional travel. The Urban Walker can easily be folded one handed with a baby under the other arm, which is invaluable for travelling on public transport. We love that the Urban Walker freestands easily when folded. At £335 the Combi at first sounds expensive, however, there is a beautiful footmuff included, and if used from birth the Urban Walker fills the gap between a heavier travel system type pushchair and an umbrella fold stroller. The Combi is so light weight and easy to use, that you are unlikely to want to swap it for anything else later on. We would recommend looking at a newborn insert to ensure the harness fits well on a small baby. However the seat is well proportioned for older toddlers. It has been enjoyable to use the Combi Urban Walker. We have awarded the Combi Urban Walker a Best Buggy 4 gold star rating, and the easy, one handed, standing fold is worthy of a special mention. With many thanks to Combi UK for their help with this review.